My old man has a Via Venezia and I recently depressurised the stock portafilter for him (removed the internal parts of the portafilter). In doing so I had to show him how to adjust his grind, dosing, tamping to ensure a decent extraction. For the standard filter basket, we found that to achieve his preferred shot, we dosed close to or level with the top of the basket (prior to tamping), adjusted the grind such that it achieved approximately 50 to 60ml (gross volume) in the cup in approximately 25 to 30 seconds. If the extraction is quicker than this and you get more volume in less time, then adjust the grind finer and try again. You will know if you go too fine as the machine will be unable to extract through the coffee and you will only see a few drips or drops in the cup. If you choke the machine like this, then generally in my experience it only takes a relatively small adjustment (depending on grinder) to get the ideal. Having said this, I'm assuming you are grinding your own coffee and not buying pre-ground. Also, of critical importance is freshness and quality of beans. Persevere and you should get a good result. The via Venezia can produce a decent shot when you get it right, and far better than with the pressurised portafilter. First place to look will be the freshness of your coffee. Also, might be better to start your own thread, rather than hijack this one. Hi leetauri, probably best if you started your own thread but the mods may move it for you??? TO answer your question, did you use a pressurised basket in your old portafilter? If so, that is most likely your problem....pressurised baskets deliver a crema even with old nasty stale coffee. The obvious solution, fresh roasted coffee (less than 4-6 weeks old is best) grind, dose and tamp. I doubt that the portafilter is anything to do with your shots, as long as it is clean. Pressurised versus non pressurised certainly will be a very steep learning and flavour curve though and certainly worth the perseverance. I have very fond memories of my Via Venezia, a gutsy little machine that smashed out a lot of coffees for me in its time. If I am off track and you were already using a non pressurised portafiler please disregard. There are heaps of answers within the search function in the top right of the screen. Good luck. "hijack" is a strong choice of words for a new snob who only has 3 posts and is obviously not intentionally trying to steer the thread away from the original content........just saying. Hi again, did you try to adjust dose and grind similar to how I explained on the thread you started re your portafilter? Did you try going fine enough to 'choke' the machine, and then progressively back the grinder off to coarsen the grind and try another shot? How much are you dosing into the portafilter (grams of grinds), how are you tamping, how long does the extraction take, and what is the weight of the resulting coffee in the cup? More info like this will enable others to diagnose and help. As others have mentioned, fresh coffee is essential also, so don't waste your time using supermarket bought beans (unless the supermarket happens to sell fresh beans from local roasters like one of the farmer jacks near me). Hello coffee snobs, after many a frustrating time trying to find a way to start my own thread I am finally here, (sorry to those peoples whose thread I sort of hijacked didn't mean to), I am new to coffeesnobs and have just registered, my wife bought a Saeco Via Venezia coffee machine (new) which I ignored for months but have now started using, now I have become completely hooked on the whole coffee making process, (including trying some very bad latte art) I have made a slight modification to our modest little setup (much to the annoyance of my wife) by changing the steam wand and have also purchased a non-pressurised portafilter, I used the non-pressurised portafilter for the first time recently and the coffee that came from it was pretty crappy with no crema at all, any helpful hints for this beginner? Couple of questions - are you using your own grinder to grind fresh beans? Pressurised baskets use all sorts of fluid jiggery-pokery to get water out of a stone, so to speak. So if there is no crema from your new basket, my first guess would be stale, pre-ground coffee? If you have fresh beans and a grinder, try grinding a little finer until the coffee just comes out in a thin stream, and let us know how you go. You've got three different threads going all dealing with the same issue. I've combined them into a single thread. i've spent the last two weeks trying to get a decent coffee out of my VV with no luck. i've manged to get a single stream of coffee out of the naked portafilter and about 50mls in 25 seconds but it always tastes like dirt. the beans are from the cafe up the road which were straight out of their grinder. using a breville smartgrinder pro. maybe i have to high expectations?? If the beans were straight out of their grinder they were stale before you got them home. Additionally to get a great shot you will need to grind on demand at home so that you can adjust the grind to account for environmental/bean/age variables. Temperature surfing is essential with the Via Venezia which has a small Stainless Steel boiler and is subject to fairly rapid temperature fluctuations. Do a search re: temperature surfing. You'll need to find the "sweet" spot for each bean you use and you will need to adjust the grind slightly as your beans age during use. A little finer grind as the days go by. 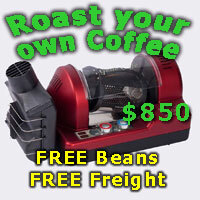 Be sure to use freshly roasted beans around 1-2 weeks old if possible from a quality supplier. Its all good fun "chasing" the bean with grind, fullness of filter basket, tamp pressure and temperature surfing!